You know when you just have "one of those days"? Today was one of them. I've been slow hitting the headlines and alerts, needing some time away from the hectic and draining coverage of the horrific Texas fires of the past several weeks. I needed a music break, and took it. "The artist's name is Justin Hines, the tune "Tell Me I'm Wrong". The incredible lyric, and the way the video production was done, showing the destruction, the loss, the feelings and the stark determination and strength of what pulls Americans together in time of need. Showing the "never say never" attitude of those affected by the disasters, and this is playing out all across Texas during the recent fires. Looking to the "other" side of the coin, you see an artist who has the insight and drive to overcome a broken body to produce a work such as this, and pursue a dream that most would find limiting. He does not have that attitude, and it shows in his music. Justin has Larsen Syndrome, a joint dislocation condition that confines him to a wheelchair. 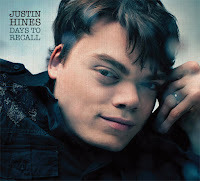 Music video by Justin Hines performing Tell Me I'm Wrong.